Soya Bean chunks are a great substitute for Non-Veg, taste great, very healthy and rich with high protein. I make them atleast once in a week and my kids love them . 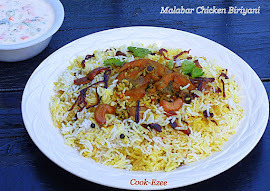 My son believe it is chicken/mutton and I try out a lot of different recipes with them. I make this mostly as a one course meal for my hubby's lunch box. 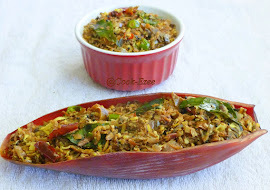 I made Soybean biriyani for my kids birthday party for the veg-rice, everyone loved it and most of my friends liked it more than chicken biriyani. This tastes really different and good from all other biriyanis. So try this out friends. Enjoy!!!! Wash the rice and drain off the water completely and set aside. Heat a thick bottom wide pan in medium heat, add ghee shallow fry the raisins and cashews and keep them aside. Add the fennel seeds to the ghee and stir for few secs. Add cardamom, cloves, cinnamon stick, peppercorns and stir for a minute or two without getting them to dark color. Pour water and add salt and let it boil. Check in 10- 15 minutes and switch off the flame when the water is fully absorbed. Let it sit for 10 mins(if you stir the rice when they are very hot rice will beak) and then gently stir it or move to one or two platters so that rice grains do not stick to each other. Pour four cups of water in a vessel and get it boil. Add the Soybean chunks to it and add salt. Stir it and switch off the stove when bubbles start to form from the sides of the pan. Let it soak in hot water for five minutes. Drain the water in a colander and pour some cold running water over it and wash the soybean chunks well with your hands to reduce the smell of soy. Squeeze out all the water from the soy chunks and set this aside. Heat a thick bottom pan or cooker, pour the oil, add the crushed ginger-garlic, curry leaves and stir for a minute. Add onion, salt and saute well till they become light brown color. Add tomatoes, 1/4 cups chopped coriander leaves and saute well till they are soft. Add turmeric powder, chilly powder, coriander powder and garam masala. Saute well till everything masala is incorporated with onion-tomato mix. Add the cooked soybean chunks and mix well. Add in 2 cups of water and mix well. When the gravy starts to boil, cover and let it cook for another 10 mins in medium heat. Pour the coconut milk and cook for another two-three minutes. 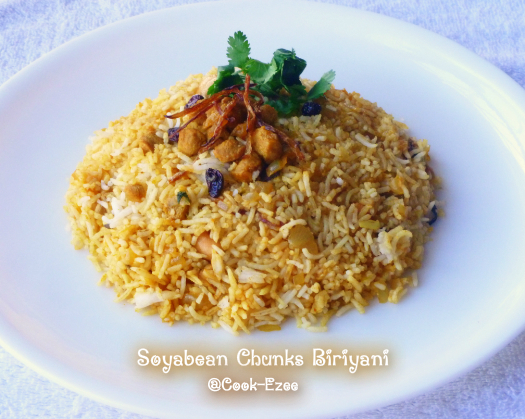 Take a baking tray and start layering the biriyani. Layering rice i the bottom followed by some soybean masala, fried raisins cashews. Top this with rice and masala, cashews, raisins. Repeat the process with rest of the rice, masala, fried cashews, raisins. Cover the tray with silver foil and bake this for 30 minutes. Take off the tray and garnish with fried onions, coriander leaves and serve hot with raita, pickle and anything of your choice. 1) You can use normal soybean chunks if you do not find mini chunks. Just cut it into halves after they are boiled if you feel they are really big. 3) If you do not have an oven you can do the dum effect(layering the rice and masala) on stove top as well, Grease a vessel with cooking spray/butter/ghee do the layering, keep the heat in the lowest and let cook for approx. 20-30 minutes. looks delicious n flavorful too,yummy!! Please send me the details of the linked recipes to my event,Prathibha..
nice recipe...looks so delicious !!! a perfect dinner ! 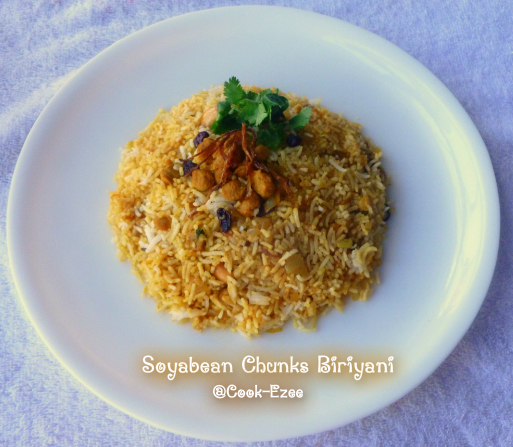 Perfect and tempting biryani..looks awesome,will surely try this.